A small piece of obsidian and a fragment of a large flat red ware dish were found in the debris of 124 [= MQ 124]. Men working as before, but nothing of interest found. My day spent in drawing pottery as was yesterday. Showed two typical Petrie-ites over the works. Men working as before. A new railroad line has been started along the western edge of the quarry. Nothing of interest found. As the quarry face is cleared, the layers of tombs become more impressive. All have apparently been robbed in modern times. The workmanship on the whole is good, though the material is poor. The serdabs are large and fine, but unfortunately quite empty. As visitors, we had Duncan Mackenzie, Prof. Moulton of Bangor, Me., and four others. These I took over the works. Work as before. The work in the Menkaure quarry was moving drifted sand. Two railroad lines are working, one with a shovel gang, the other being loaded by basket. The eastern face of a fine large mastaba was largely uncovered. This is interesting in that the northern third is of masonry, fine large blocks, while the southern two thirds is rock. The door which has not yet been uncovered, is apparently in the masonry construction of the north. This is apparently the largest mastaba so far found. Otherwise nothing was discovered. A large gang was at work cleaning up the court in front of the Senedem-ib=Yenti [Senedjemib Inti, G 2370] mastaba. Some large inscribed stones were found and some fragments with painted decorations, one of which is interesting as it shows Nekhehu in different colors, exactly like the larger stone showing him painted in fine colors which was found some time ago. Of other objects, a fragment of a limestone seated figure, interesting as the legs were cut free from the background; a limestone model box from a servant's statue, with peghole in the bottom. 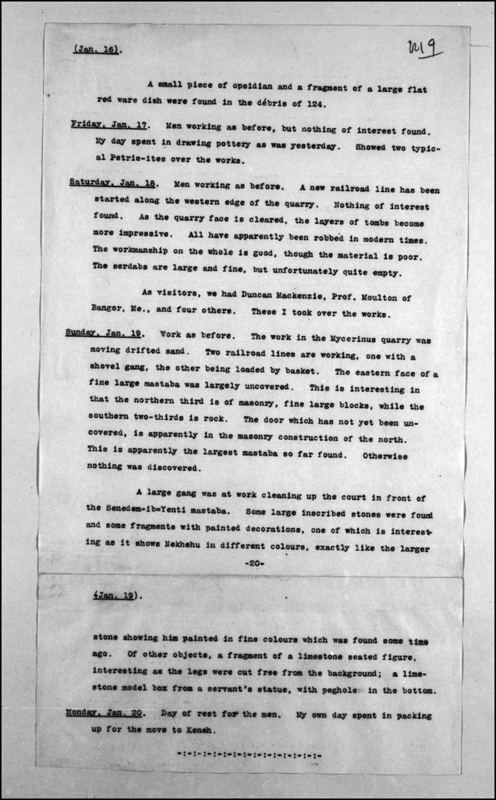 Remarks Worked on the MFA-Harvard expedition from 1912-1914 according to the preface of George A. Reisner's, "A History of the Giza Necropolis, Vol I." Harvard graduate, c.1912.